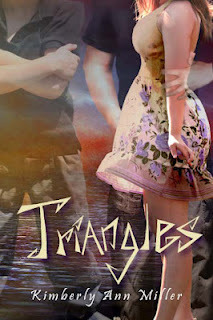 Triangles was originally one of my most anticipated reads of summer, and when I finally got my hands on it after months of agonizing torture, I couldn’t have been happier. That being said, there was a lot that led to Triangles being one of my least favorite Read of the Weeks. Starting out, Triangles is a very fun, but serious at times, kind of read. Everything anyone could imagine from a summer read: fun, flirty, fervorous and thriving(Or am I actually just chanting lines from 13 Going on 30? Whoops.). As the plot thickened, though, things started to go downhill for the summer breakout. While there wasn’t much necessarily wrong with Triangles central theme, I found that some prospects were taken over the top. As Autumn’s cruise makes its way into the Bermuda Triangle, alternate realities ensue. Miller could have had loads of fun playing up multiple scenarios but, much to my dismay, took the much more serious road. Visiting cancer, a one-year anniversary to a boy she thought she’d just met yesterday, and being happily married with child to Joey, the “loser” she can’t seem to shake off, the alternate realities aren’t as enjoyable as one might imagine. While the point is to, of course, teach Autumn a lesson, I thought it could have come across as less harrowing. There were times that were lighter but I still felt like they were weighed down by the noticeable seriousness of everything else going on around Autumn and her web of melodramatic self-demeaning sissy fits. Bringing us back to characters, I found Autumn to be a bit too full of herself, and when she wasn’t being full of herself, she was whining about being full of herself. This problem is later on fixed in the plot, but it was still too annoying for me to handle. I have no idea how Joey took all her crap without twitching a muscle. The way she treated him was beyond a level of rudeness that’s accepted in the real world and part of me wishes he might have slapped some sense into her, literally. He was the sweetest underdog as well as my favorite character and it broke my heart the way everyone went about unjustly mistreating him. This is mainly what caused most of the frustration I felt towards the book. There could have been way more consideration on Kimberly and her editors part that could have easily taken care of the tense way Triangles was written. As flawed as it was, there was much more to Triangles than meets the eye; the trauma over the loss of a loved one, new responsibilities arising as one ascents into adulthood, accepting the life we have as one we should appreciate, and knowing love when you see it. Even though it doesn’t seem much like it, Triangles was deceptively entertaining and makes for a good, short, quick read when putting aside all the bad there is to consider.